Last week number was a palindrome, 262 forward and backwards is the same. The flu hit the team during week 262 and productivity pretty much dropped to zero. Therefore, not much news or progress that week. It is now the end of week #263. Slightly better productivity. Still lagging after week 262, but certainly improving. Our iOS app has now been approved by Apple. This makes the iOS and tvOS equivalent to ship. We pressed the Release Button, so now it is available to the world. 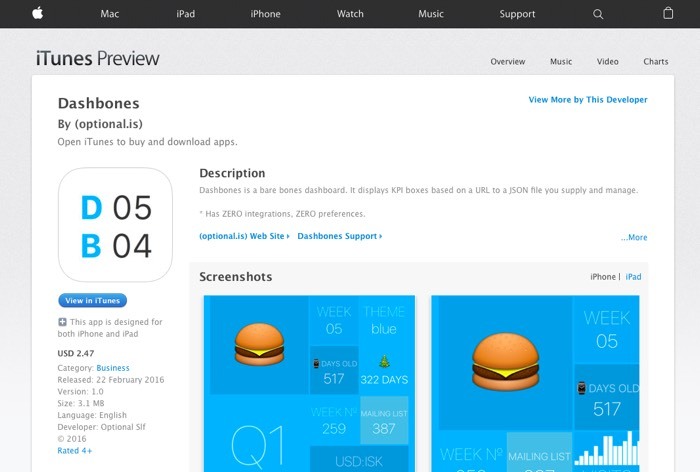 If you need a dashboarding tool for your AppleTV, iOS device (and eventually watch) then Dashbones is for you. It is an incredibly simple, artisanal browser that renders JSON into a dashboard for your Apple Devices. It grew out of a necessity for ourselves. There will be lots more to come, improvements, an HTML version, Apple Watch, etc. For only $1.99, it is really worth buying to get the future updates. This week, we’ve also been making progress on our Virtual Reality Data Visualisations which will be part of the Strata Conferences at the end of March. We are tasked with putting together 2-3 data visualisations in VR which exemplify some of the technology. Our first example is a sort of “how big is it” for money. We have a anchoring $100 bill in real-size. This gets you a feel for how big various amounts of money really are. Every few seconds the main pile changes to another value. 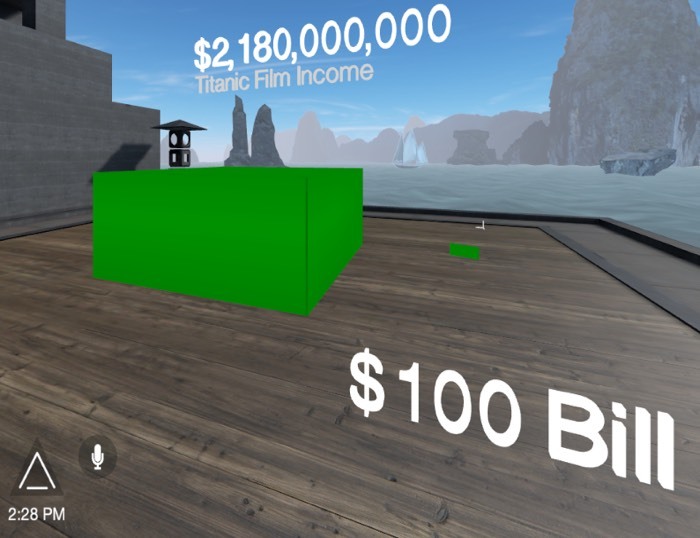 As a person, we know $1 Billion is much more than $1 Million, but the scale in VR is much more impressive. The ability to walk around the cost of a shuttle launch ($450,000,000) is impressive. We’ll keep smoothing out the design, but we’re happy with where it is going. The next example we’ve put together is a sort of “data henge” where you stand in the centre of 36 pillars and the line graph is drawn around you. Right now these are just random numbers, but eventually we’ll connect this with a real data source, maybe temperature, stock prices, or something else. The interesting part of this is you really need to be in the centre of the ring to fully appreciate it. It is sort of like IMAX or other 360° movies. We wanted to have something very immersive and surrounding. We haven’t started the 3rd data visualisation, we’re waiting to get feedback on these two as well as seeing if there is a corporate sponsor, in which case, we might tailor the 3rd design a bit more towards their industry. This is an ingenious little pencil sharpener. It allows you to join small stubs together. It sort of makes me want to go to IKEA, take loads of those little golf pencils and start making some larger ones. Somehow, as you watch the video, you find it is pretty anti-climatic. We’ll end on some cuteness. This little raccoon can’t seem to figure out where all the cotton candy goes to when he washes it! On a side note, bookkeeper is the only word in the English language with 3 sets of consecutive letters. But that is only if you discount the people who store their racoons in nooks because they are raccoonnookkeepers, a whopping 5 sets of double letters! Have a good weekend, we’ll be here all next week.